Taichung Port | PROSPERCO | Prosperco Logistics Int'l Corp. 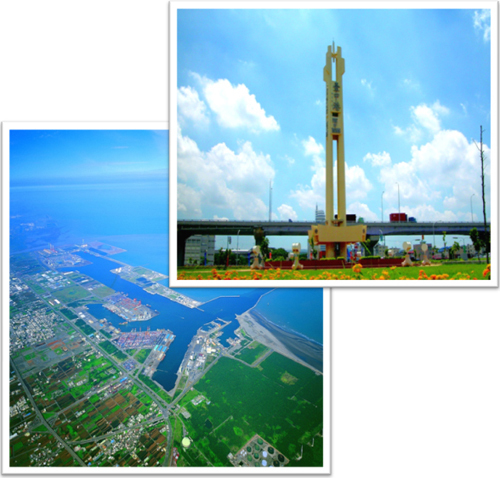 The Taichung harbor located in Wu-Chi, Taichung County, East longitude 120o 29′ 27.3″, and North latitude 24o 17′ 40.3″. The previous name of Wu-Chi was “Dian Bai-ah Kang”. Most of the residents have historically made their living through fishing, so the nickname is “Mong Goh Liao”, and since it is located to the west of Ao-Feng Mountain, is called “Ao-Sai”. In 1891 the local residents had a meeting and changed the name to “Wu-Chi”. In 1895, Taiwan was ceded to Japan after the Sino-Japanese War and in 1938, Japan began to plan construction at Taichung Harbor, calling it “New Kao Port”. In 1944 the construction plan was put on hold due to Japan’s loss in World War II. In the early sixties, the R.O.C. government enthusiastically promoted the economy and the expansion of international trade, resulting in a dramatic increase in imports and exports. This caused the Keelung and Kaohsiung ports to become congested with shipping traffic. As the government recognized the fast growth of international trade, work commenced on construction at the port to expand in order to meet the new requirements. In August of 1968 investigation and research was begun regarding the new port’s location, and was finished in July 1969. The report recommended the administration office regulate the Taichung harbor as a new international port, synthesizing business, industry and fishing purposes. The construction office of Taichung harbor was set up on Feb 1, 1971, and the first stone was laid by the north dike on Oct 31, 1973. This step was the beginning of the construction process for the Port of Taichung. 3F.-1, No.859, Sec. 4, Taiwan Blvd., Xitun Dist., Taichung City 40767, Taiwan. Copyright 2012 Prosperco Logistics International Corporation, All Rights Reserved.